The Mary McDonald Rare Book and Manuscript Collection provides the Oregon State University community with access to a wide range of rare and valuable manuscripts, books, and prints. The McDonald Collection contains items from both the sciences and humanities collected by Mary McDonald and Oregon State University for their historical significance and craftsmanship. This exhibit makes available the collection’s most striking items through a narrative history of the evolution of text production from approximately 3000 BCE to the 20th century and features examples from many of the world's most important intellectual and technological advances in printing. Roger Hayward (1899-1979) was a talented artist, architect and inventor who is primarily remembered today for his distinct and prolific work as a scientific illustrator, collaborating for many years with Linus Pauling and Scientific American magazine, among others. This exhibit explores Hayward's life and work in greater detail, recounting along the way the fascinating story of a true American Renaissance man. At various points a poet and a puppeteer, Hayward was also an expert on optics who played an important role in the development of the Schmidt-Cassegrain telescope. He was a remarkable individual whose life story is full of surprises. This exhibit has been developed through extensive use of the Roger Hayward Papers, which are available for research in the Special Collections & Archives Research Center, Oregon State University Libraries. The Emergency Committee of Atomic Scientists was founded by Albert Einstein in 1946 to educate Americans about the dangers of nuclear war. This exhibit introduces the Committee, its work, and the response from citizens through documents and letters in a collection within the Ava Helen and Linus Pauling Papers at the Special Collections and Archives Research Center at the Oregon State University Libraries and Press. To browse the letters and transcribe them, click on Transcribe Letters. To explore data from the collection through data visualizations and facets, click on Explore the Collection. To explore the collection through record tags, click on Browse by Topic. Since its designation as a land grant institution of higher learning in 1868, Oregon State University has been led by nineteen presidents, including five acting presidents. Each has had a significant influence on the University. This online exhibit consists of images and biographical information retrieved from the OSU Libraries Special Collections & Archives Research Center holdings. Between 1940 and 1943, the number of farm workers in the United States noticeably decreased because of armed forces manpower requirements and competition with higher paying jobs in the defense industries. At the same time, farmers were asked to increase production as part of the successful prosecution of World War II. By 1943, the successful harvest of the nation's food supply was in jeopardy. 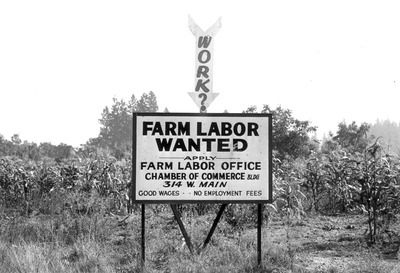 On April 29, 1943, the 78th U.S. Congress approved Public Law 45, the Farm Labor Supply Appropriation Act, in order to "assist farmers in producing vital food by making labor available at the time and place it was most needed." The state's agricultural extension services assumed responsibility for the emergency labor programs, primarily by coordinating and overseeing labor recruitment, training and placement. In Oregon, the Emergency Farm Labor Service was established by the Oregon State College Extension Service. Between 1943 and 1947, Oregon's Emergency Farm Labor Service assisted with over 900,000 placements on the state's farms, trained thousands of workers of all ages, and managed nine farm labor camps. Farm laborers included urban youth and women, soldiers, white collar professionals, displaced Japanese- Americans, returning war veterans, workers from other states, migrant workers from Mexico and Jamaica, and even German prisoners of war. This exhibit is a tribute to everyone who was a part of this unparalleled wartime effort -- the farmers, Extension Service personnel, and, most of all, the emergency farm workers. The Oregon Extension Service was established July 24, 1911 to extend the knowledge of Oregon's Land Grant University to the rest of the state. Over the past century, hundreds of Extension agents have worked tirelessly to support that mission by engaging even the most rural of Oregon's citizens in improving their lives at work, in the field, and at home. This exhibit is a look back at Oregon's Extension Service and the people who have made it the program it is today. The Oregon Chinese Disinterment Documents digital collection provides access to documents pertaining to the 1948-1949 disinterment of hundreds of Chinese immigrants’ remains from cemeteries throughout Oregon. The bulk of the documents consist of the applications and permits to disinter human remains; these were required by the Oregon State Board of Health. All of the cemeteries’ applications and permits list the names of the men to be disinterred and most list the date that they were buried. The collection also includes various shipping related documents. They date from the summer of 1948 through the summer of 1951 and include information regarding the purchase of the boxes in which to place the remains, shipping invoices, receipts, insurance, and some correspondence. This historical exhibit tells the story of Waldo Hall on the Oregon State University campus in Corvallis. This exhibit was created by the collective efforts of students in HST 415/515 Digital History course in Winter Term 2013 -- Allison Burr, Kasey Clay, Anna Dvorak, Micheal Jager, Kayla James, Jodi Keeling, Adam LaMascus, and Reid Miller -- under the guidance of instructor James Capshew. We thank Tiffany Kennedy for first suggesting Waldo Hall.